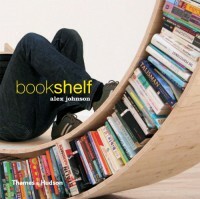 Based on Alex Johnson's blog about bookshelves (theblogonthebookshelf.blogspot.com), this is a collection of the myriad styles of bookshelves as traditional cases, single shelves, furniture, and everything in between. The hardcover edition is nicely bound and chock full of beautiful full-colour images of every piece, each with a website address for the particular designer. At the back of the book is a further reading section listing book titles, articles and website links to related reading. As a design book, it's great. For a serious bibliophile constantly struggling for creative ways to defy the laws of physics, it's a fun book to flip through but rarely does it offer practical ideas (though there are a few gems) for anyone but those that have small collections or extraordinarily large houses.